"This Turkish-style pizza is a Turkish flat bread layered with a fresh sauce composed of tomatoes, sweet bell peppers, and minced lamb cooked with a flavorful selection of Mediterranean spices. It is normally garnished with fresh salad and a creamy garlic sauce and or a tangy zesty hot red pepper sauce. It is a really light meal, but filling and flavorful. I find it worth the time to make if I can't get it from my favorite Turkish bakery in my old neighborhood in Amsterdam. For the best flavor, make the topping the night before you make the pizza." Heat a large skillet over medium-high heat. Combine the garlic, onion, basil, parsley, mint, paprika, cumin, coriander, diced bell peppers, lemon juice, and olive oil in a food processor. Pulse the vegetables until finely chopped. Add the halved tomatoes and process until the mixture is a thick puree. Place the lamb in the preheated skillet and reduce the heat to medium. Add the puree and the tomato paste and mix well. Cook and stir until the lamb is cooked through, 10 to 15 minutes. Stir in cayenne pepper and salt to taste. Transfer the mixture to a shallow baking dish to cool to room temperature. Cover with plastic wrap and refrigerate overnight. Dissolve the yeast and sugar in 1 cup warm water. Combine the flour and salt in a mixing bowl and stir well. Add the vegetable oil and 1/2 cup water to the yeast mixture and pour it over the flour. Use your hands to mix the dough. Turn the dough out onto a lightly floured surface and knead until smooth and elastic, about 8 minutes. Shape the dough into a ball and transfer to an oiled bowl. Cover with a wet towel and let rise in a warm place until doubled in bulk, about 1 hour. Remove the lamb sauce from the refrigerator and allow it to come up to room temperature. Prepare the garlic sauce: combine the yogurt, parsley, crushed garlic, and salt and pepper to taste. Stir well and set aside. Punch the dough down, transfer it to a floured work surface, and cut the dough into 10 portions. Shape each portion into a round. Flatten each round with your hand; use a rolling pin to roll each piece into a 10-inch circle. The dough should be thin, like a crepe. Place the rounds on parchment paper. Stir the lamb sauce and then spoon it onto a dough round. Spread it thinly to the edges and press down lightly so it sticks to the dough. Bake pizzas on parchment paper-lined baking sheets on the lowest oven rack until the edges are a light tan color, 8 to 10 minutes. Place on a wire rack to cool. The pizzas can be stored in an airtight container in the refrigerator for three days or in the freezer for three months. To reheat, place the pizzas in a 350 degree F oven (175 degrees C) for 8 minutes. 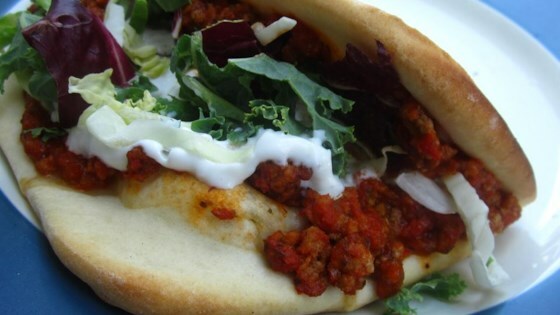 To assemble the lahmacun, drizzle with garlic sauce, top with shredded cabbage, and roll up to eat. See the Cook's Notes for other garnish ideas. Additional condiments include chili sauce, harissa, or Tabasco. In place of the cabbage, you can combine 1 cup lettuce, thinly sliced tomatoes, cucumbers, and red onion. To assemble, arrange cabbage, lettuce, cucumbers, tomatoes, or onion down one side of the pizza. Drizzle with garlic sauce and hot sauce, and roll up. Eat and enjoy--but watch out for the drip. You won't want to miss a bite! If you can't find ground lamb in your area, you may substitute ground beef. I love lahmacun and usually never put basil but found it to be great. Thank you! Simply fantastic! Made it for Iftar (meal to break the fast in Ramadan), and my entire family loved it (from the 6-year-old to my picky husband). Leftovers also delish! Excellent dish! The only down side is the large amount time it takes to make.